Nollywood three, Ufuoma McDermott, Omoni Oboli and Chioma Akpota have come across some choleric fans on their page who have bashed and criticized them for talking about kissing a married actor: Richard Mofe Damijo. 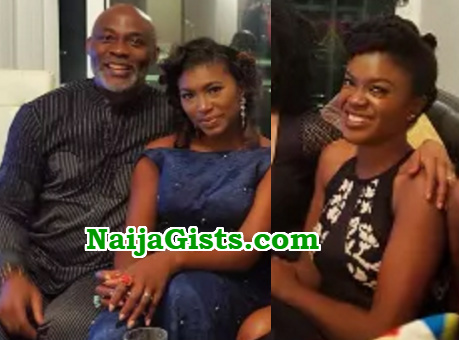 The drama started when Ufuoma McDermott posted a picture of RMD with herself on her page to celebrate the ace actor’s birthday. The caption of the post however generated a lot of controversy. 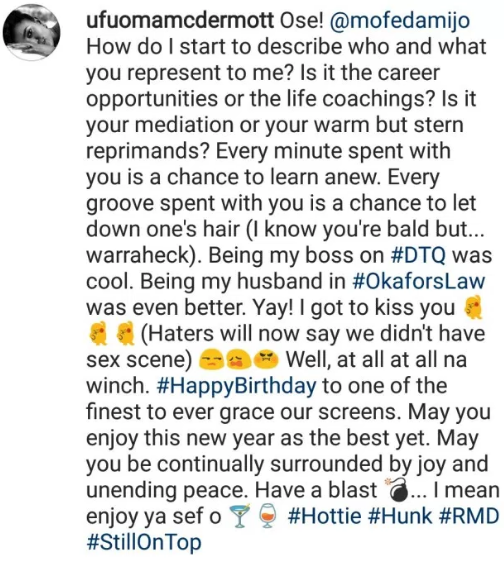 In her caption, the actress mentioned how she was lucky to have played the role of RMD’s wife in Okafor’s Law, a role that made them kiss each other. 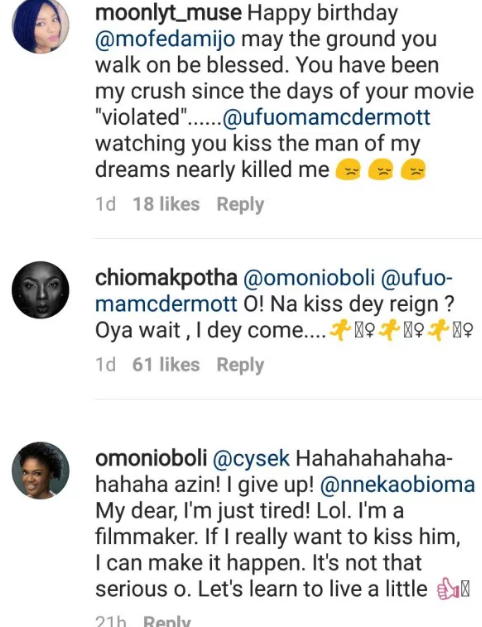 Omoni Oboli also dropped a comment that she envied Ufuoma’s role in that movie. 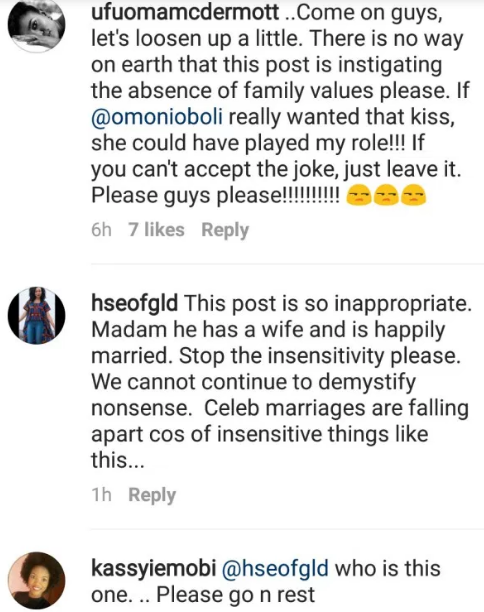 In no time, their friend Chioma Akpota joined and the three friends were laughing at their own jokes until some party poppers joined in to criticize them for fantasizing about kissing a happily married man. According to the party popper, many marriages have been shattered because of insensitive comments like this. 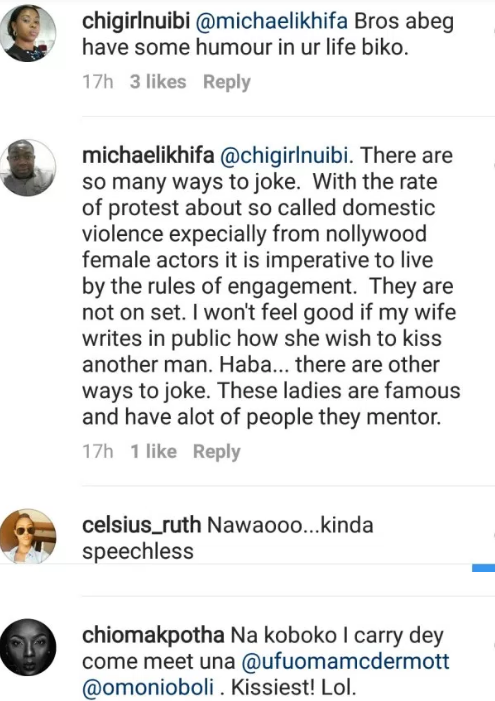 The actresses tried to make him see reason but dropped it when they noticed he clearly lacks humour. so na to kiss grandfathers( old school dey rain) married women take it easy oh! 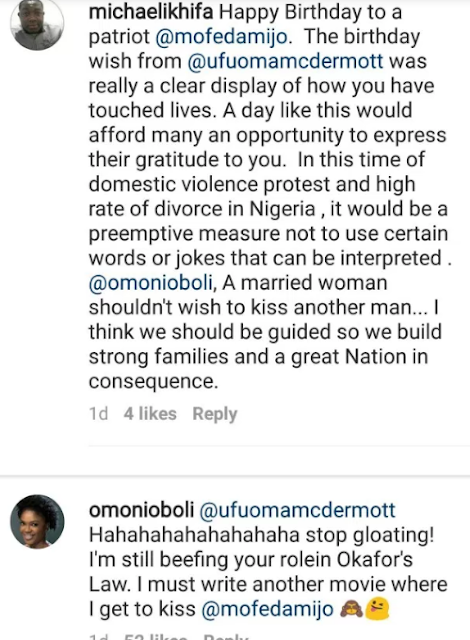 mrs chioma chukwuka a make them no spoil u. Of course, you do not joke about issues like that. RMD’s wife battled some anxieties about his faithfulness. To have even joked about it meant they fantasised about it and the joke was a Freudian slip. It is wrong this means that all of you do admire RMD. You don’t consider his marital status. Omoni shame upon you, it has now come to your attention that each time you want to kiss another woman’s husband is through an organised movie. And you Chioma are you not married? is your hub awake? You guys,its high time started reasoning.